This week’s Sepia Saturday prompt image is of a water mill in Wales. My husband’s great great great grandfather, William Smith Daw (1810 – 1877) was a miller. In 1841 he lived at Upcott Mill, near Sheepwash, Devon. He and his wife Mary had five children aged between 6 months and 9 years. One was my husband’s great great grandmother Sarah (1837 – 1895). When I was looking for information about the Sheepwash mill, Gary from Sheepwash told me that the mill site now had only ruined buildings. He referred me to the 1839 tithe apportionments and map, and pointed out that millers tended to move around quite a bit as they rarely owned their own mills. In 1839 Upcott Mill at Sheepwash was owned by the Reverend William Bickford Coham and George Coham Esquire who seem to have owned considerable amounts of land in the area. 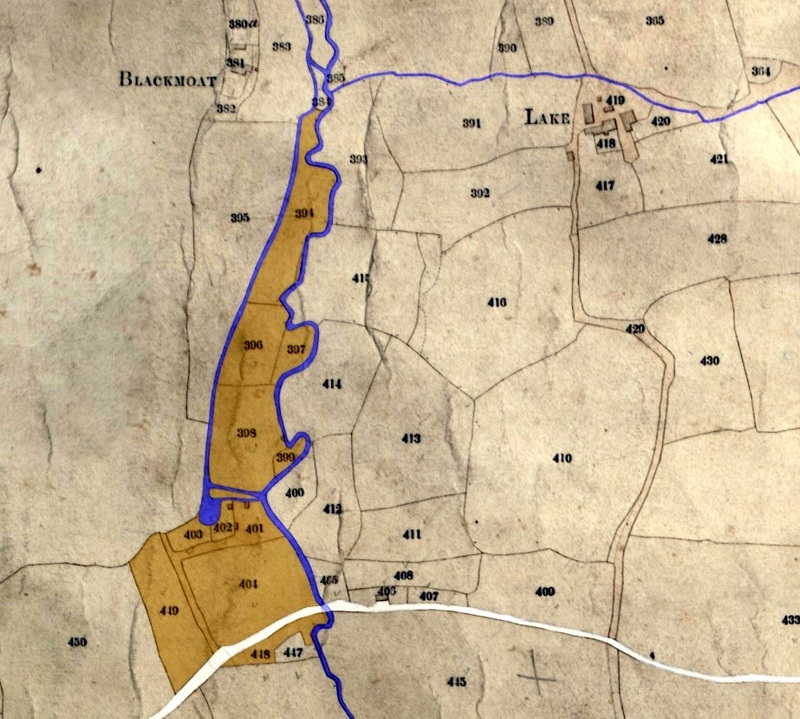 The Tithe apportionment shows a number of fields and an orchard associated with the mill. 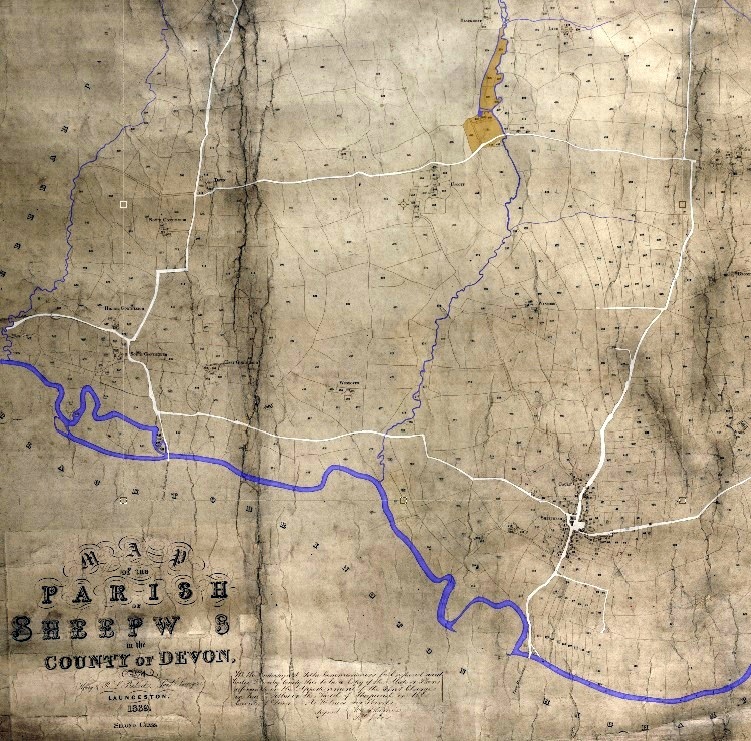 1839 Tithe map for Sheepwash, Devon showing the fields associated with Upcott Mill. The tithe map is available through http://www.devon.gov.uk/tithemaps.htm . The highlighting was done by Gary, a resident of Sheepwash. The location of Upcott Mill north of the village of Sheepwash on Mussel Brook can be seen from the full map and can be compared with Google maps. 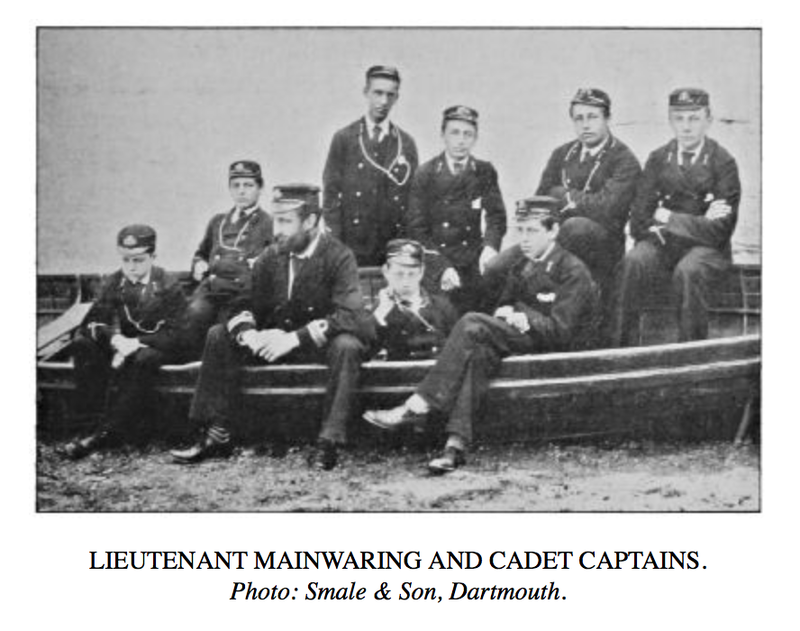 In 1851 the Daw family were at Wendron, Cornwall, just over 80 miles south-west of Sheepwash. 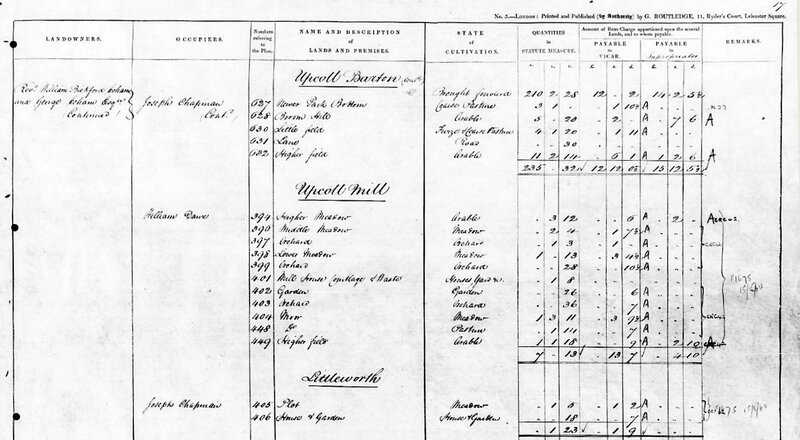 In the 1851 census William Daw was described as a miller and farmer of 25 acres. 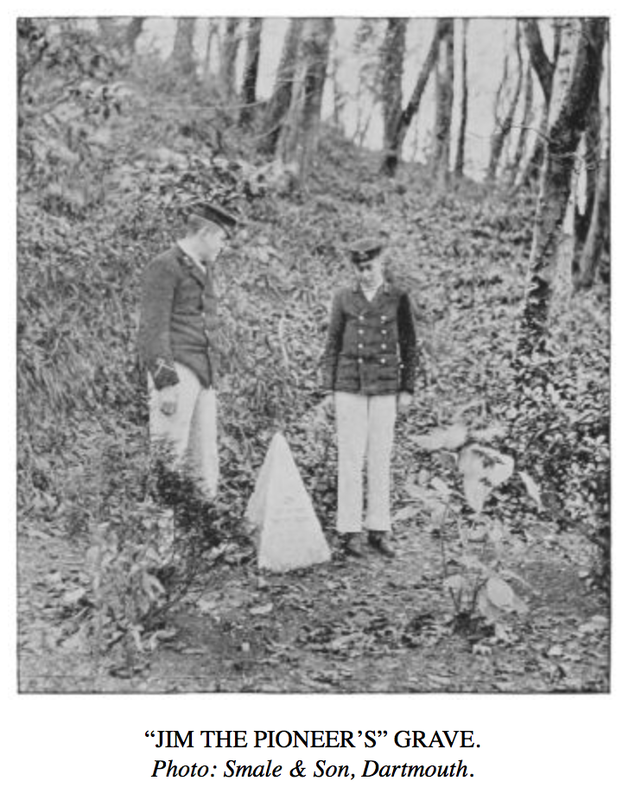 Confirmation that it is the same family is obtained from the birthplaces. For example, Elizabeth aged 11 in 1851 was born in “Shipwash”, Devon. The family moved to Cornwall about 1844. Honor, aged 8 in 1851, was born in North Tawton, Devon. Louisa, aged 6 in 1851, was born in Helston, Cornwall. Trelubis, also written Trelubbas, was a hamlet midway between Helston and Wendron near Trannack,. It is not marked on Googlemaps. 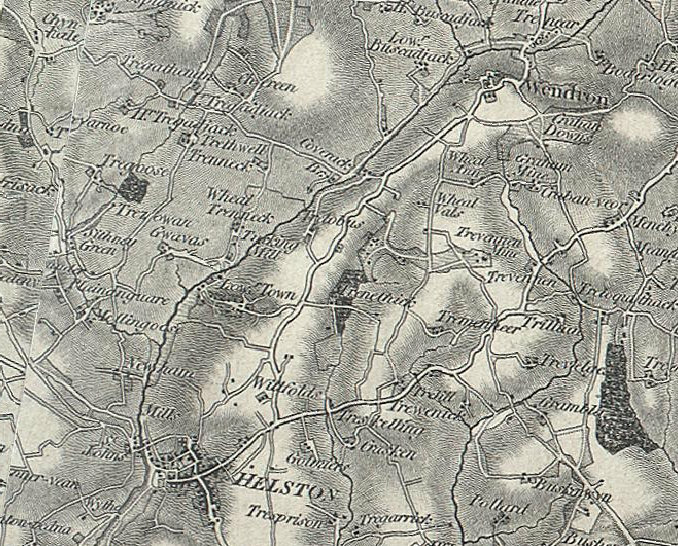 The 1876 Ordnance Survey map gives more detail, though I am not sure where the mill at Trelubis was. 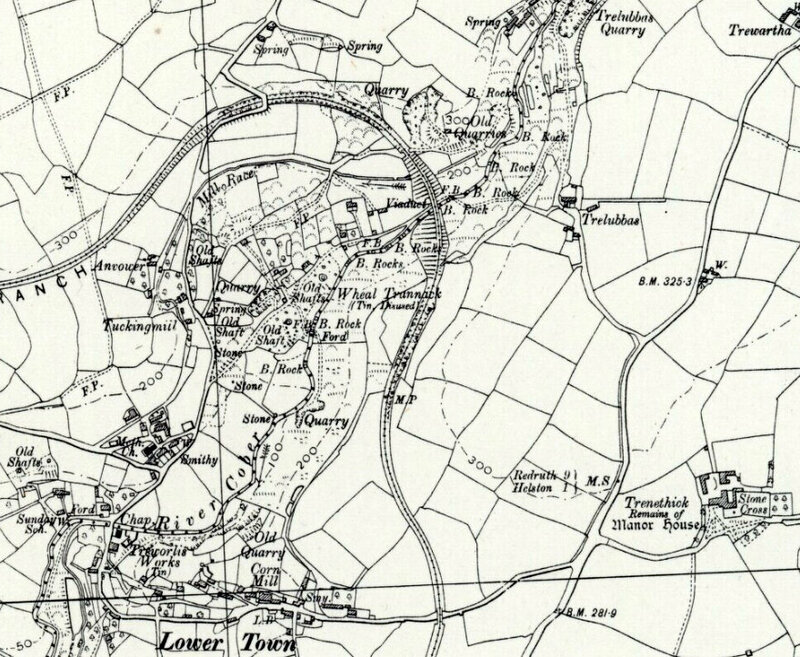 Perhaps it was the mill immediately above the label ‘Lower Town‘. In 1853 the Daw’s youngest child Sophia was drowned. She was just 14 months old. 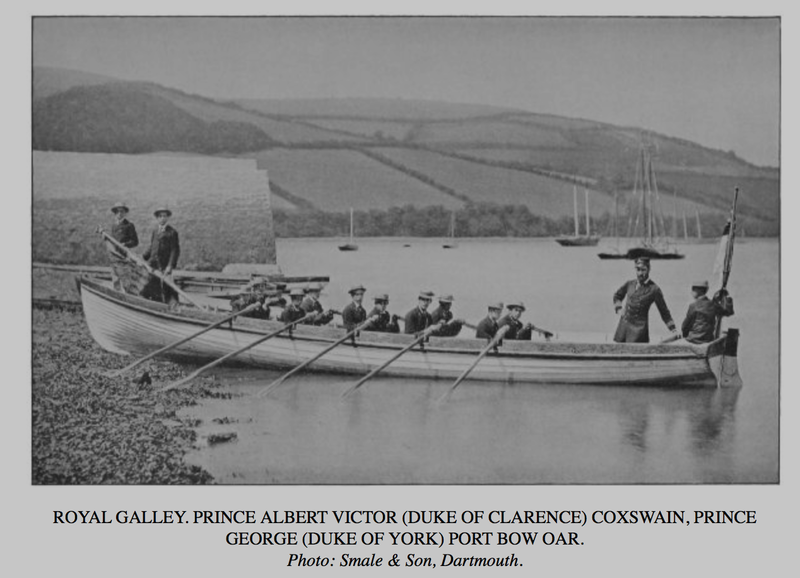 I learned from the family history website of Lorna Henderson, my husband’s 5th cousin, (http://familytree.lornahen.com/pi27.htm ) that the Daw family were millers in a number of places in Devon and Cornwall. Lorna was trying to work out which family members might be pictured in a photograph that her grandmother had of Lumburn Mill, Tavistock, West Devon. I still have much research to do on this generation of the family.